Here at reviewhockeysticks.com we love the Grays Jumbow shape. It is a fantastic elite style curve used by many top players around the world. Adding the Jumbow to the Grays GX5000 hockey stick makes an affordable, high quality stick that will suit the intermediate or slightly better hockey player. This is going to particularly suit a midfield player who likes to dribble and attack. We have managed to review the 2014 model of the Grays GX5000 Jumbow and if you shop around online you will be able to get a fantastic deal on this stick from various places including amazon. Let’s take a look at the Jumbow first. This is the name for the certain type of shaft on many Grays sticks and we focus our review here on the GX5000. With a 24.75mm curve that bows beautifully right from the tip of the handle to the heel of the face, the Jumbow gives you everything you want from a shapely hockey stick bow, without the distinct kink in the shafts of some of the low bow hockey sticks. For many the distinct kink in hockey stick shafts can make dribbling difficult and hitting unpredictable. The Grays GX5000 Jumbow mixes the power benefit, controllability and aerial ability nicely with a smoother straighter feel that does not give you the troubles of the more kinked sticks. Most Grays sticks over the last few seasons that carry the Jumbow, like the GX5000 in this review, will have Jumbow printed somewhere near the head of the stick. Try and find someone who has a Jumbow and you will be able to try it out for yourself. If you choose a Grays GX5000 because of the Jumbow shaft for the fact you have more control, particularly in hitting, you’ll also be pleased when you start striking the ball. For a stick of its price the Grays GX5000 hits really hard. With 40% carbon fibre, 10% aramid and 50% fibreglass the GX5000 is extremely solid. The Grays GX range of hockey sticks feel chunky in my opinion, in a good way. Over and above the materials and weight there is something to be said about hockey sticks sturdiness. The Grays GX5000 seems to grow out of the handle in to a good chunk of a hockey stick. When I was swinging it around for the review I was impressed just how sturdy it felt. Don’t be put off by it’s size though when preparing for this review I found the Grays GX5000 Jumbow in 3 different weight options. My colleagues review of the Grays GX7000 says how the weight of Grays sticks is often slightly more than other brands. With Super Light, Light and Medium options you will find a version of the Grays GX5000 to suit you strength level and get yourself a really manoeuvrable but solid hockey stick. Probably my favorite feature of the Grays GX5000 2014 model is the head and particularly the face of the stick. Grays add a gripping finish to the head of their sticks which does work well to control the ball when dribbling. This is of course a feature on many stick these days but the 2014 model of the Grays GX5000 Jumbow I review really felt great in this area. I would suggest if you are a fast runner that likes to keep the ball on the end of the stick that this feature of the GX5000 Jumbow will really benefit you. Overall this review of the Grays GX5000 Jumbow is positive. You have to remember their area sticks out there at 4 times the price. Probably unjustifiable if you train once and play once every week. 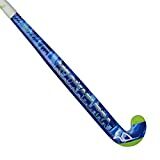 Utilizing this fantastic Jumbow shaft and supported with enough quality in all other areas the GX5000 is a great purchase for the skillful midfielder looking for a good quality bowed hockey sticks. Since writing this review the GX5000 is also included in the Grays 2015 collection. I can’t find anything about it that is different to the 2014 model. Certainly nothing that will effect its playability. The superlight version of this stick gives you a Grays option of a light weight stick. It’s not the lightest out there so if it’s light you normally choose then superlight would be good for you here. Online you can get this stick for around £80 which is a bargain really.